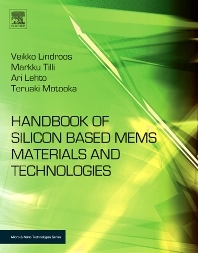 A comprehensive guide to MEMS materials, technologies and manufacturing, examining the state of the art with a particular emphasis on current and future applications. Written by 73 world class MEMS contributors from around the globe, this volume covers materials selection as well as the most important process steps in bulk micromachining, fulfilling the needs of device design engineers and process or development engineers working in manufacturing processes. It also provides a comprehensive reference for the industrial R&D and academic communities. Veikko Lindroos is Professor of Physical Metallurgy and Materials Science at Helsinki University of Technology, Finland. Markku Tilli is Senior Vice President of Research at Okmetic, Vantaa, Finland. Ari Lehto is Professor of Silicon Technology at Helsinki University of Technology, Finland. Teruaki Motooka is Professor at the Department of Materials Science and Engineering, Kyushu University, Japan. Engineers, researchers and scientists in sensor manufacturing.